Upgrading to disc brakes comes with some great benefits: They include greater stopping power (even in bad weather), easier and more infrequent maintenance, and longer life. 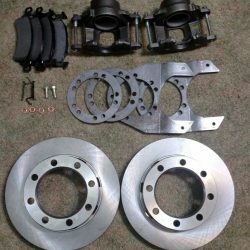 However, you can only reap those benefits if you have a high-quality disc brake conversion kit that’s installed correctly. Do you believe that your new disc brakes aren’t performing optimally? Then, take a look at the three most common disc brake conversion issues to see if you can pinpoint the problem and solve it yourself. 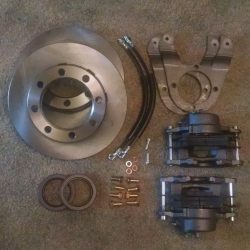 PLEASE NOTE: This article discusses some of the more common problems that people have with a disc brake conversion kit installation. However, when it comes to disc brake conversion kits offered by Lugnut4x4, all our kits are intended as bolt-in replacements. This is because our kit is designed to work with the standard OEM brake system (including master cylinder and proportioning valve). As long as you’re installing one of our disc brake conversion kits on an original vehicle application (meaning it’s not an axle swap), the existing brake system will work just fine. 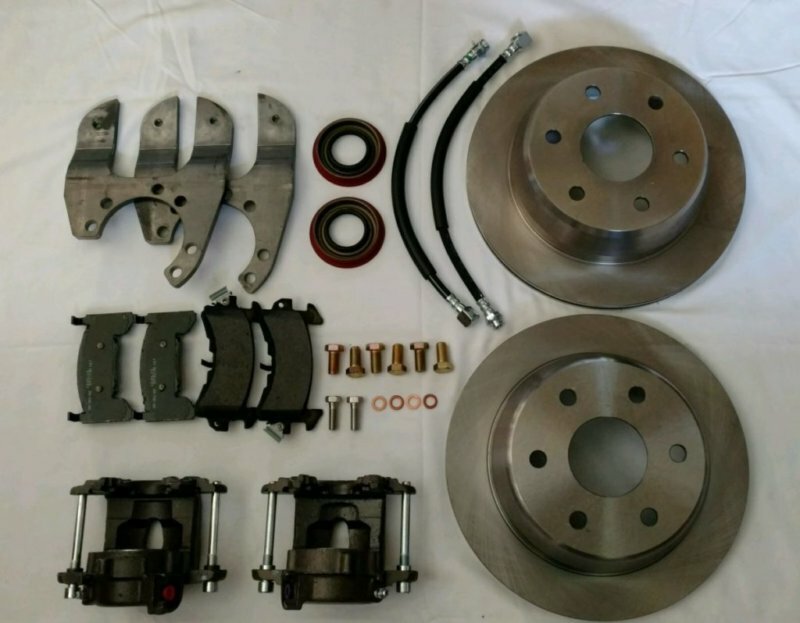 When you buy a Lugnut4x4 disc brake conversion kit to upgrade your original drum brakes, we send you everything you need (except the brake fluid). 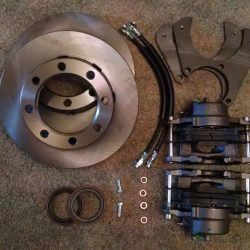 It’s common for car owners to experience issues just because their disc brake conversion kit doesn’t fit well. A lot of the companies selling disc brake conversion kits don’t test every single fitment. This is less of an issue on newer vehicles, but is a pretty common problem on older vehicles. A poor-fitting disc brake conversion kit can lead to serious problems down the road, such as brake system failure. The best way to address this issue is to replace your ill-fitting disc brakes with disc brakes made by a reputable company like Lugnut4x4. Lugnut4x4 ensures that their kits will precisely fit every make and model for which the kit is intended. If you haven’t ordered a disc brake conversion kit yet, make sure you understand the return policy before you order. And test fit all the components before you get too far into your conversion. When your brake pedal feels too spongy, sensitive, or odd in general, it could mean several different things. It’s because a lot of different components work together when you press your brake pedal. Just one bad or mismatched component could affect the way your pedal feels. Sometimes it’s just a symptom of a brake system that wasn’t bled correctly. Check all of your work for leakage. Review your caliper locations to ensure that the bleeder valve is at the top of the brake piston. If the bleeder valve is lower than the top of the caliper piston, the brakes won’t fully bleed. Check the brakes at all four corners to make sure they’ve been bled properly. Swapping to disc brakes can bring a lot of air in to the brake system. Some systems need to be bled 2-3 times. Determine if you have a proportioning valve and/or a hold-off valve. Check with the brake conversion kit manufacturer to verify that you have the correct size master cylinder. If you still have a hard time figuring out why your brake pedal feels strange, then we suggest enlisting the help of a professional. Missing or mis-calibrated hold-off valve: Do you have front discs and rear drums? If so, the hold-off valve allows pressure to build in the brake system and overcome the resistance of the drum return springs before the front disc brakes engage. The goal is for all four brakes to begin braking at the same time. If the hold-off valve was removed, the discs will engage immediately, and the drums might not engage at all at low pedal pressures. If the hold-off valve is missing or incorrectly calibrated, it may explain why one set of brakes is engaging too early. You have a hold-off valve you don’t need: Did your vehicle originally have front discs and rear drums? If you converted the drums to discs, you may have a hold-off valve that you don’t need. Missing, mis-calibrated, or non-functioning proportioning valve: The proportioning valve shunts pressure between the front and rear brakes. The goal is to keep the rear brakes from locking up under heavy braking. Some proportioning valves are located in the rear of the vehicle or along the frame rails. You may have to do some exploring to find it. Sometimes the valve actuating mechanism may have rusted to the point where it no longer works. Air in the brake system: Your brake system needs evenly distributed hydraulic pressure to function properly. When air gets into the brake lines, it disrupts the balance of hydraulic pressure. An undersized or worn out master cylinder: The master cylinder is the source of pressure for the brake system. When your master cylinder is too small, it’s not creating enough pressure and this results in your brakes engaging slowly and without enough force. If the seals within the master cylinder are worn, internal leakage can cause the brake pedal to feel soft. If your hold-off valve, proportioning valve, and master cylinder look good, then the issue is probably air in the brake system. If you’ve determined that there’s air in your brake lines, then you’ll need to bleed the brakes. Hopefully this will correct the brake engagement. Experiencing Another Issue With Your New Disc Brakes? There are several other issues that could crop up as a result of incorrectly sized or installed disc brakes. You should consider the possibility that you may have an extra hold-off valve in your system. Many newer brake systems use a combination hold-off valve and proportioning valve. But this is a relatively recent practice. Decades ago, these were separate valves. You may have a brake system that already had a hold-off valve installed. If you added a combo valve to the system, that would result in some very strange braking system problems. The hold-off valves were sometimes located down in the frame rails, so this happens more often that you would guess. What if You’ve Eliminated All of the Possibilities? Incorrectly installed brakes are a common problem. If you’re experiencing issues and you’ve eliminated all the possibilities, be sure to double check your work. Many people have installed a set of calipers upside down or forgotten to tighten something. In fact, it might be easier to double check your work before troubleshooting any of the problems listed above. If you’ve purchased one of our disc brake conversion kits, feel free to contact us for assistance installing it. We want to help you avoid any of the common issues listed here. We want the project to go as smoothly as possible for you, so we’ll help in any way we can.